DoggyLoot, online at DoggyLoot.com, is the Daily Deal shop for your best friend. 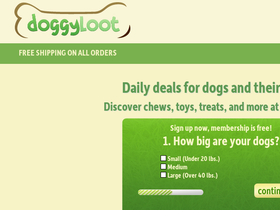 DoggyLoot offers big discounts each day on a variety of items dogs and puppies go crazy about. DoggyLoot carries toys, treats, nutrition bars, bowls, grooming necessities, leashes, bones, chew toys, and more. DoggyLoot has brands owners appreciate, like ThunderShirt, The Kygen Company, Best Bully Sticks, Loving Pets, happytails, GoDog, and others at discounts up to 75%. But before you shop, be sure to get all the latest DoggyLoot.com discounts, Doggy Loot promotions, and Doggy Loot coupon codes found here at RetailSteal.com. DoggyLoot offer free shipping within the U.S. See site for more information. Shop at DoggyLoot.com to find daily deals up to 75% off on a great selection of treats, toys, dog accessories, and more. Click link to shop. Shop at DoggyLoot.com and enjoy free shipping on all your orders. Click link now to shop. Shop for treats and toys dogs and puppies love and save up to 75% at DoggyLoot.com. Click here to shop. DoggyLoot has tasty all natural treats from $12. Click here for today's deal. Save up to 70% at the PetCareRx Clearance section! Click link for details. Click link to get free shipping from PetCareRx on your order of $49 or more. Visit PetCareRx for all your pet care needs and save up to 50%. Click link. Spend at least $40 online at USPets.com and you'll be qualified for free shipping! Enjoy free shipping on flea and tick spot treatments from Dog.com. Click to shop today! Enjoy free shipping on dog crates that are over $69 from Dog.com. Save up to 20% on dog food, treats, toys, flea control and crates from Dog.com. Enjoy flat rate shipping of $4.99 on orders over $49 from Dog.com. Click link to shop. Use coupon code to get 5% off your order from $100 or more from TSCPets.com. Use coupon code to get free shipping on your order over $250 from TSCPets.com.